We've had a rough trot since the beginning of 2009 with one challenge after another, but it's beginning to feel like things may be turning around for us. Let me count the ways. 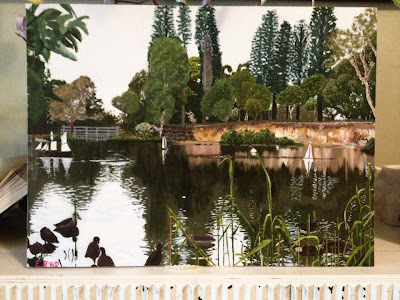 Today is the absolute last deadline for Erik to submit his painting for the Local Landscapes exhibition at the Ian Potter Annex at Federation Square. If you're a Melbournian, or visiting in the next little while, be sure to check it out, it's very handy to Flinders Street Station, on Federation Square. Most of the art is by Australian grade six students and you might spot a future national treasure! Of course, to me, my son is already a treasure and I'm so proud of his painting. We're all thankful it's finally finished! Now he'll have a break for a couple of weeks and then he'll get started on a painting for the Artist Camp Fair Art Show - he's hoping to sell and make a bit of pocket money! This week our laundry flooded. The Grumpy Old Man realised the water was coming from our new (to us) front loader washing machine. So far this isn't sounding like our luck is changing, but keep reading... The thought of having to get a new washing machine when we just sold our perfectly good washing machine to make room for this one was gnawing at me when I rang the repair company and arranged a looksee for yesterday. Luckily for us, it was just little feeder hose which has worked its way loose, probably due to the move from South Australia to Melbourne. So, the total cost of fixing the machine was only $55! Woot! I'm very thankful to a friend for starting a Facebook page for new vegans. I've been trying to transition to a vegan lifestyle for years. A lot of people feel threatened by others making different choices to them. They feel those different choices are somehow a judgement of them. Sometimes making different choices does come with a side serve of judgement from some people, but unfortunately that judgemental behaviour then stigmatises other people who make the same choices but bear no judgement of others. It's incredibly unfair, really. I want to be vegan but I also totally get that other people don't and I'm fine with that because there are plenty of things I don't want to be or do that other people think are very important, too. Anyway, coming up against ridicule when trying to make a change in one's life which is significant (to me) can make changing so much harder than it needs to be. It is nice to have a place of support and sharing successes and challenges and I'm very thankful for that. I am thankful for the opportunity to buy two couches and a television stand which will mean everyone in our family can sit down in our lounge room at once (without someone having to sit on the coffee table or the floor). I didn't think we'd have the money to do this but then we received an unexpected amount in our account - exactly what we needed for these items. Then, of course, the washing machine died and I thought we might have to spend the windfall on getting a new one, but we didn't, yay! Sadly, this opportunity comes at the cost of farewelling friends. However, I'm thankful to have made these friends and thankful that modern technology will mean being able to keep in touch quite easily! I am thankful to have heard that a publisher is considering the idea of publishing a series of young adult fantasy novels for school kids and is interested in my manuscript. While nothing may come of this, I'm thankful for the interest - I was beginning to think this little novel might be a dead weight. I am thankful for all the support I've had over the past fortnight for getting my PhD proposal together and for having a plan of action which might even bring some extra income into this house (via a scholarship). Yes, I think things are starting to turn around for us. I'm thankful for seeing a light at the end of this long, dark tunnel! how lovely for you to feel that things are taking a turn for the better. Good things really do come to those who wait. Your son is such a talent with that brush it just looks divine! So good to hear that things are looking up for you. Wow you have every reason to be proud of Eric - that is an amazing picture ! Wishing him every success in the future. 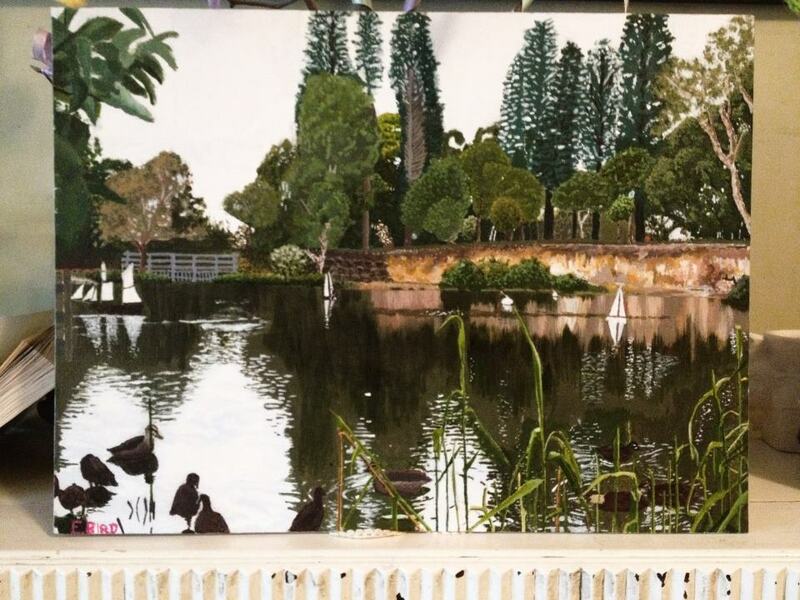 No way, is that actually his painting and not a photograph? It's AMAZING! He has quite a talent! So happy for you that things are looking up. Well, stay tuned Clel because later today I'm actually posting a blogpost with a very funny story about the couches - and you will be mentioned (initial only)! Thank you, everyOne, for your enthusiasm and support! I really appreciate it!